Mark Henry led five fighters into battle inside the Octagon during the month of April and it would have been six, but Magomed Bibulatov was a last-second scratch from the fight card in Atlantic City, New Jersey. Affectionately known as “The Iron Army,” the Jersey-based collective includes the team’s namesake, Frankie Edgar, former lightweight champ Eddie Alvarez and a host of contenders and prospects scattered across various divisions and, over the last few weeks, they’ve been one of the most active teams in the sport. 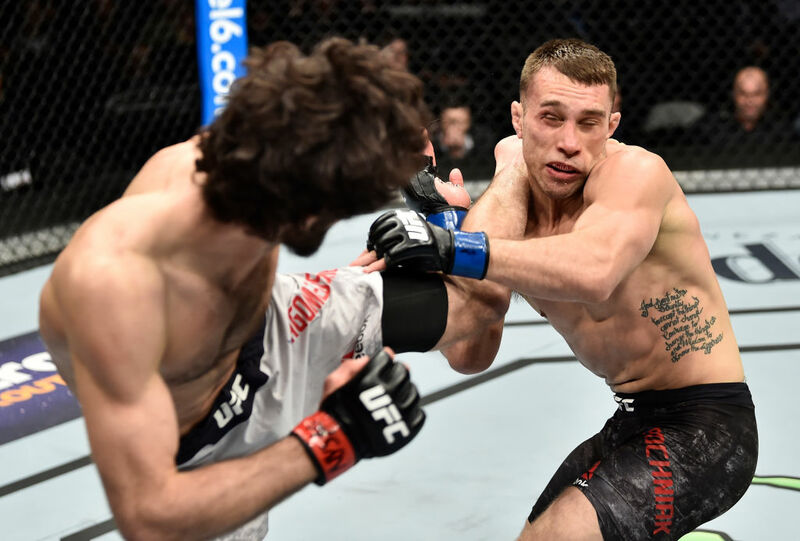 Rising star Zabit Magomedsharipov got things started with a victory over Kyle Bochniak in the Fight of the Night at UFC 223 in Brooklyn before one of his close friends and mentors, Muslim Salikhov, picked up his first UFC victory the following week in the Arizona desert. A few days later, Henry ventured down the Garden State Parkway with Bibulatov, Corey Anderson, Edgar and Edson Barboza to compete at Boardwalk Hall, with a bad back sidelining the flyweight Bibulatov the day before the event. When the action hit the cage, Anderson and Edgar picked up convincing wins, while Barboza landed on the wrong side of a stoppage loss in a gutsy effort against Kevin Lee to close out the show. “The pros are that you’re going through a time frame where you’re getting closer to the fight, you’re nervous, you’re thinking about your opponent, so it’s great that someone is going through that with you and knows what you’re going through with the weight cutting, the mental preparation,” he said of having so many fighters preparing to compete in successive weeks. “The only downside is preparing the day of the fight. While their combined results were very good and everyone would love to emerge victorious every time out, Henry’s greater point of pride when speaking about the team’s recent appearances and overall complexion is the character make-up of the men and women that form the team. The leader of the crew is Edgar, the former lightweight champion turned perennial featherweight contender who bounced back from the first stoppage loss of his career with a dominant victory over Cub Swanson in Atlantic City, and includes lightweight standouts Alvarez and Barboza, plus emerging stars like Magomedsharipov and Marlon Moraes. “He’s a professional’s professional,” Henry said of Edgar. “Everybody falls in line because they see how hard Frankie works and since he’s been in this sport, nothing has changed for him. He still trains like he’s going for the title for the first time. Not even that – it’s like he’s trying to get into the UFC; that’s his mindset. Having that kind of veteran leadership in the room has been an invaluable resource for Henry, Ricardo Almeida and the rest of the collection of coaches as two of the team’s young, emerging stars – Magomedsharipov and Moraes – begin to make their own waves inside the Octagon. In just three appearances, the 27-year-old Dagestani featherweight everyone simply refers to as Zabit has gone from newcomer to nouveau celeb; a favored choice as one of the top emerging talents on the UFC roster and a potential future champion. For the audience and many in the media, it has been a rapid introduction and ascension for the talented featherweight upstart, but for Henry and company, it has been a validation of what they’ve seen in the gym and were telling people about Magomedsharipov long before he first set foot in the Octagon. “We’re blessed that our camp is a lower-weight killer-fest, you know?” said Henry, rattling off the roll call of talented names that represent the Iron Army from flyweight up through lightweight. “We’ve a good gauge of if you’re good or not and when you’re sparring these guys – and all these guys are sparring each other – we have a good gauge of what he’s going to be able to do. “When you watch him spar, he’s a natural,” he said of Magomedsharipov, who also draws high marks from Henry from the intangibles he brings to the table like toughness, humility and championship-level work ethic. “I’ve seen a boxer who is a natural and a baseball player with that natural, beautiful swing, but I’ve never seen a natural MMA fighter who is good in wrestling and judo and Muay Thai and boxing and jiu-jitsu. While the 15-1 featherweight rising star was one of the breakout performers of the last month and is generating a ton of buzz at the moment, Henry believes that Moraes, who returns to action in the main event of the UFC’s debut event in Utica, New York in early June opposite Jimmie Rivera, is deserving of similar attention. “We’ve got Marlon and Sijara (Eubanks) on that card,” he began, “and I’m excited for Sijara too because she got so much better from the show and we thought we were going to take the title. It was so heartbreaking that she didn’t fight for the title, so I’m excited for her fight. The Brazilian bantamweight arrived in New Jersey roughly six years ago, sporting a 7-4-1 record. A victory over former WEC champ Miguel Torres introduced him to a larger audience and his 11-fight run of success under the World Series of Fighting banner established the 29-year-old as one of the top 135-pound fighters competing beyond the borders of the UFC. Matriculating to the biggest stage in the sport has led to that qualifier being removed and Moraes being recognized as one of the top bantamweights in the sport, full stop, but Henry believes fans haven’t seen the best of “Magic” quite yet. “People don’t even know how great his wrestling and jiu-jitsu is,” he said of Moraes. “He’s so hard to take down; it’s almost impossible. He’s as explosive as Edson with his kicks as you saw in his last fight. As each fight keeps going on in his career, I feel like he’s getting more and more comfortable and we’re starting to see the real Marlon Moraes. “He wants this fight,” Henry said of Moraes’ pairing with Rivera in Upstate New York later this spring. “I know there is a little trash talk between them and I’ve even used some of it. I grabbed some stuff off of Jimmie’s (social media) and put it in my basement so he can see it when he’s training.